Motorists drive on a section of Portland Way South that is due for a road project starting in July. About 35 people came to the Galion Municipal Building Monday evening to learn more about the latest phase of the Portland Way street project. Mayor Tom O’Leary said on Tuesday that many residents came to the meeting with good questions about the phase of the project that will begin at Grove Avenue and end near the railroad tracks. “Instead of having one lane open in one direction during this phase of the project, we will be completely shutting down the street in segments for three-week periods,” O’Leary said. O’Leary said the latest part of the project will begin the first or second week of July and will last until around Thanksgiving. 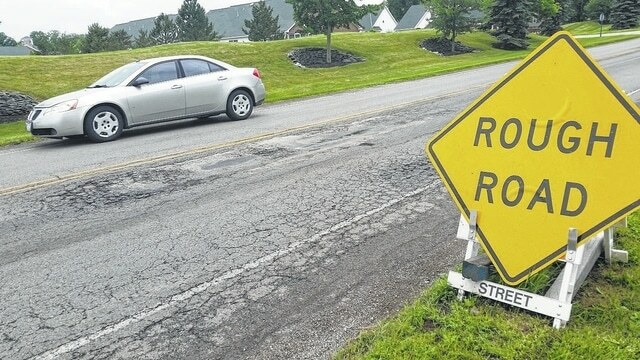 “The feedback we received last night from residents was really positive and they want to see the project done correctly, not just putting a bandaid on the street issues,” O’Leary said. O’Leary said there will be alternative routes in place for residents to get to their destinations.